Now, more than ever, we are determined to finish what we started. Mothers and babies in 21 countries are depending on Kiwanis. They’re waiting for us to fulfill our pledges—so we can turn promises into funding; funding into vaccines; and vaccines into lives saved and futures protected. The end of this disease means the beginning of better health for so many of these families. Kiwanis International's Eliminate Project surpassed US$100 million in cash and pledges with the start of district conventions. Kiwanis' new total includes the Canadian government match and a record US$7.5 million raised in one weekend—the most money Kiwanis International has raised in such a short amount of time. The fundraising fervor swept across Kiwanis during district conventions this month. Florida, Georgia, Illinois-Eastern Iowa, Montana, Nebraska-Iowa, Southwest and Texas-Oklahoma joined Austria, Belgium-Luxembourg, Capital, France-Monaco, Louisiana-Mississippi-West Tennessee, New Jersey and Taiwan in making district-wide commitments. We have less than US$10 million left to raise in the next five months. This is an exciting and historic time for The Eliminate Project. Our victory over maternal and neonatal tetanus is not just achievable; it is inevitable. Our collective efforts will help save or protect more than 55 million women and babies. That's enough children to fill 2.2 million kindergarten classrooms this fall. The World Health Organization’s validation survey confirmed that Mauritania has eliminated maternal and neonatal tetanus (MNT). Thanks to the generosity of Kiwanis members around the world, UNICEF and its partners, 36 countries have now officially declared victory over the pain and suffering of MNT. We are changing the world. 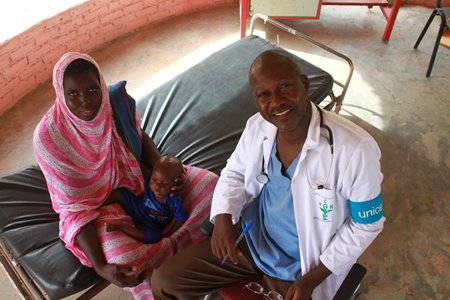 Our friends from UNICEF Mauritania shared their appreciation in a special video message. We encourage you to watch the video and share it with friends and colleagues. With The Eliminate Project, we are part of the final push to eliminate MNT from the face of the Earth. Gifts from you and your club provide much-needed funds to protect the connection between mothers and babies. With The Eliminate Project, Kiwanis International and UNICEF have joined forces to eliminate maternal and neonatal tetanus. This deadly disease steals the lives of nearly 49,000 innocent babies and a significant number of women each year. The effects of the disease are excruciating — tiny newborns suffer repeated, painful convulsions and extreme sensitivity to light and touch. The Kiwanis family has raised more than US$51 million in cash and commitments as of April 16, 2014, which will save or protect at least 28.3 million women and their future babies from maternal and neonatal tetanus. Several countries are planning immunizations campaigns this year. This includes activities aimed to immunize more than 3.7 million women of reproductive age in the DRC (Democratic Republic of Congo), Haiti and Angola this month. $100K Club pledges play a key role in these efforts. Pledge payments ensure UNICEF can carry out current immunization activities your. As a $100K Club member, I urge you to send in funds now. The faster contributions are received, the faster they can be used. As Kiwanis leaders, this is our chance to lead by example. April 24, 2014 is Worldwide Report Day when Kiwanis International posts the updates and status reports on funds raised for Eliminate. Visit this link to see these reports . The Eliminate Project in Ottawa a success! Our Club was proud to host Kiwanis International President Tom DeJulio and First Lady Rosemary, and Governor Peter Tudisco, at our luncheon on May 3rd. It was noted by many to be a fabulous luncheon and our 85 guests were impressed! We were pleased to welcome our special guests and to receive greetings from Kiwanis International and District. UNICEF Canada President & CEO David Morley brought greetings from UNICEF and their positive feeling about another partnership with Kiwanis. The room was silent when KI VP Dr. John Button shared his heartfelt presentation on the Eliminate Project and the need for us to help.